Fig. 3. 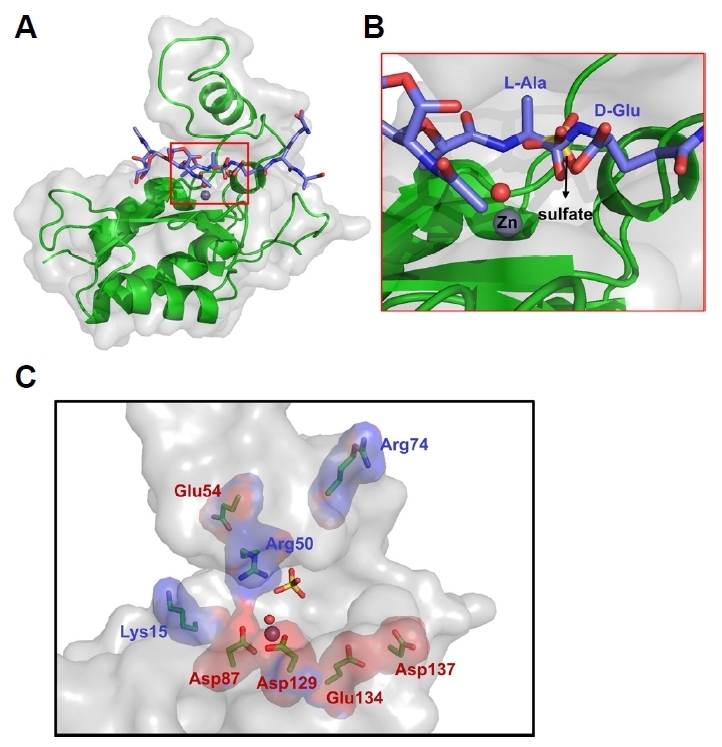 (A) The docking model of the LysB4 EAD with the ligand (GlcNAc-MurNAc-L-Ala-D-Glu-meso-DAP-D-Ala). The LysB4 EAD is shown in the cartoon (green) and surface (gray) representation, and the ligand is shown in the stick model (purple). (B) The carbonyl group of the peptide linkage between L-alanine and D-glutamic acid overlaps with the site of the sulfate ion. The sulfate ion is shown in the stick model (yellow) and the bound water molecule and Zn2+ are shown in a red sphere and a gray sphere, respectively. (C) The basic residues (blue) and acidic residues (red) of the LysB4 EAD around the active cleft. Zn2+ (gray sphere), the water molecule (red sphere), and the sulfate ion (yellow stick model) in the cleft are shown.